According to Michael McDonald's terrific website, there are three states in which early voting has already exceeded its totals from 2004. These are Georgia, where early voting is already at 180 percent of its 2004 total, Louisiana (169 percent), and North Carolina (129 percent). Hmm ... can anybody think of something that those three states have in common? 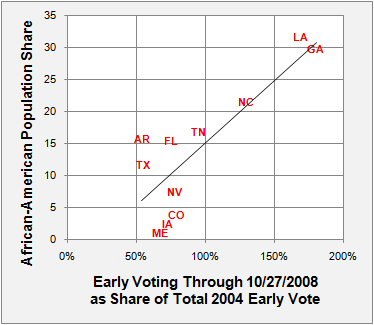 So when McCain's pollster talks about Obama's black vote being "locked in", he is at best getting the story half-right. It's true that there aren't very many African-Americans who are reporting themselves as undecided. But any polling based on 2004 assumptions about what black turnout will look like is probably going to miss the mark significantly. Frankly, I do think that McCain is the favorite to win a majority of undecideds (but a majority means like 55-60%, not some ridiculous fraction like 70%). But I also think that the polls are probably undercounting Obama's decided vote, particularly among African-Americans, and young persons with cellphones.